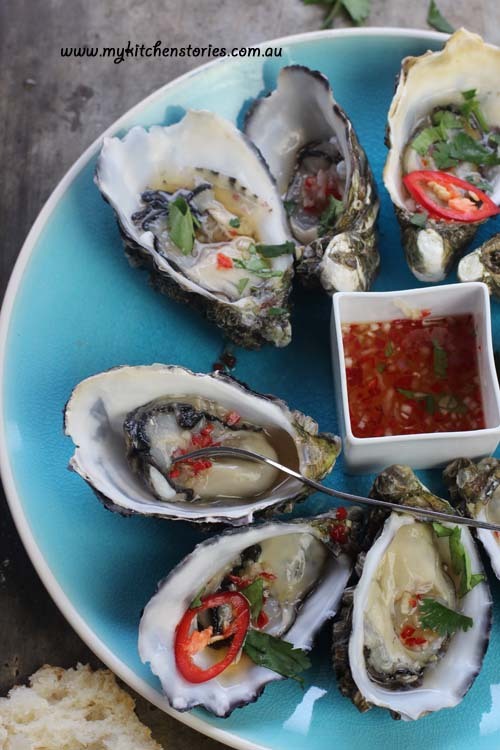 Try these Oysters Spicy Maple Dressing for an extra treat. 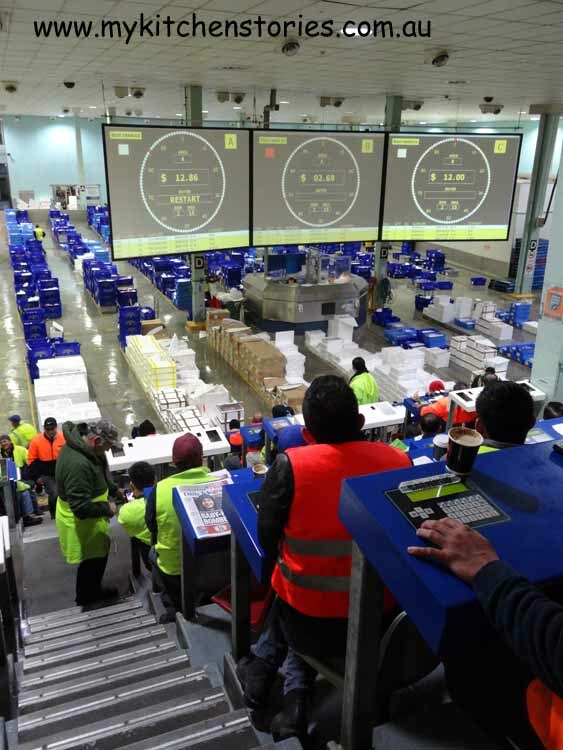 And did you know you can do a special tour of The Sydney Fish Market? I had a very interesting morning last week. 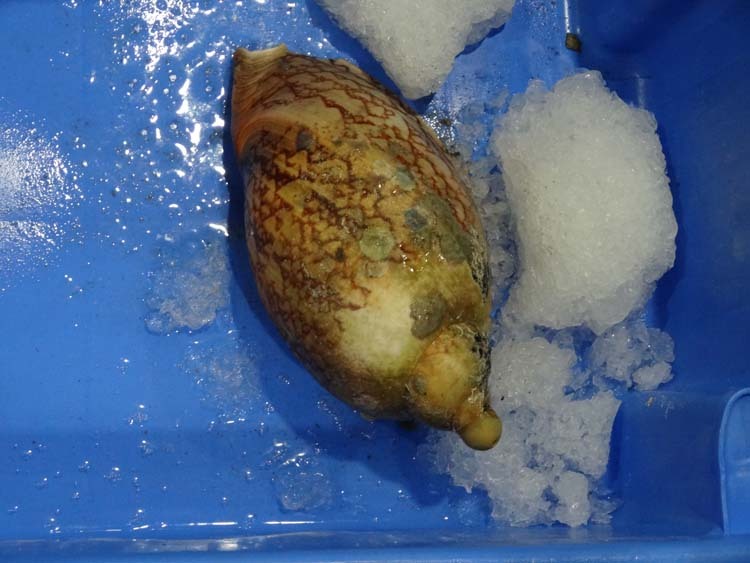 I pulled into a parking space in the dark at the Sydney Fish market. At 6am the carpark is full of vans and trucks and there is barely room for a car to squeeze in amongst them. In the main arcade the lights are on and the smell of the fryer is already evident. There are people working away cleaning seafood and icing up the counters in preparation for the day. The Blackwattle deli is dispensing coffee and there is a waft of baking bread from Gregory’s breadshop. A small group of people are waiting outside the entrance to the Sydney Seafood School, where they will be met by their Sydney Fish market Tour Guide. 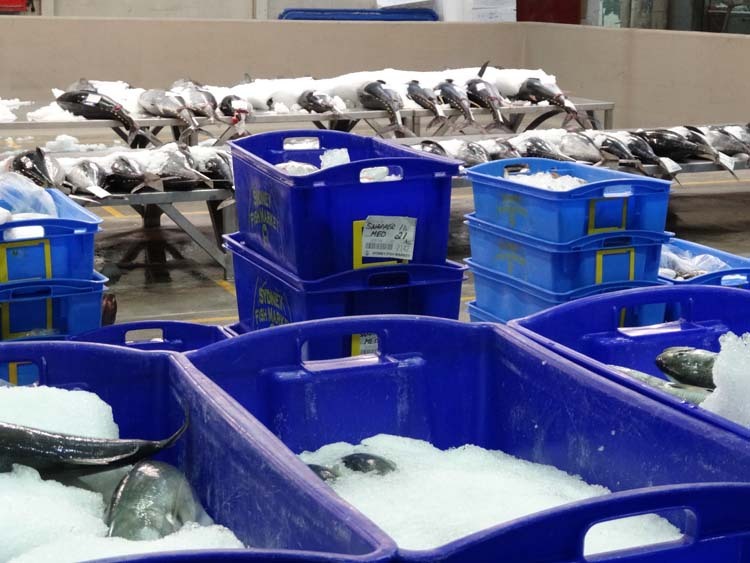 I have never been to a large fish market auction room, so I am looking forward to seeing what goes on. 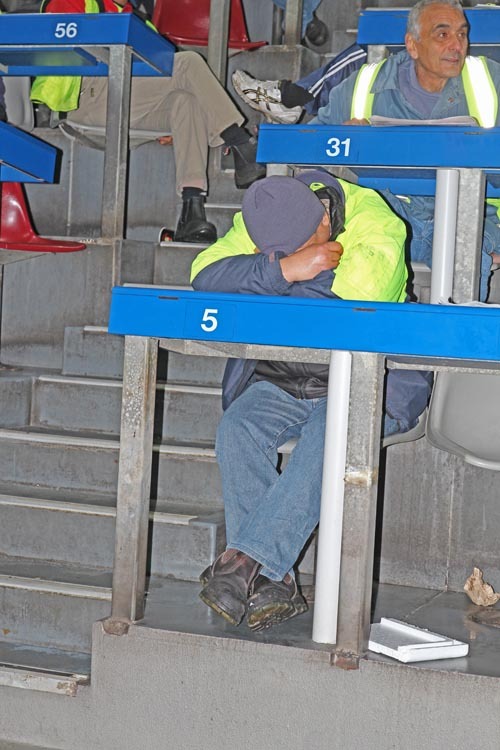 This is a tour down onto the auction floor where the seafood is snapped up by buyers sitting on what look like bleachers at a sporting event. I have been kindly allowed to do the tour alone with Bonnie Hughes the marketing coordinator at the SFM. Once we get inside the auction room it’s cold and there is a constant low hum of the auctioneers voice talking to the buyers at auction. The view from here is like watching a big game but each time the scores go up someone has bought some seafood. The Sydney market runs a “Dutch Auction” to around 150 registered buyers, that’s an auction structure in which the price of the offering is set after taking in all bids and determining the highest price. In this type of auction, investors place a bid for the amount they are willing to buy in terms of quantity and price. The auction itself starts at 5.30 am and continues until all product is sold. 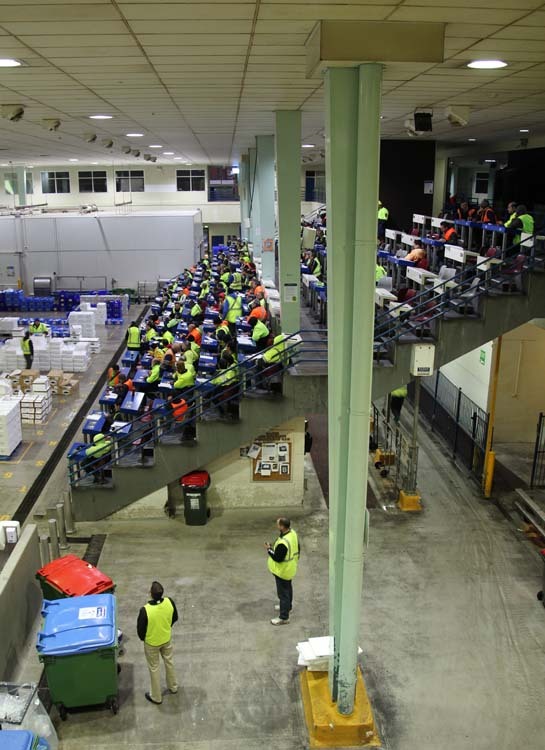 The volume of product varies each day and it may finish as early as 7.30 am. 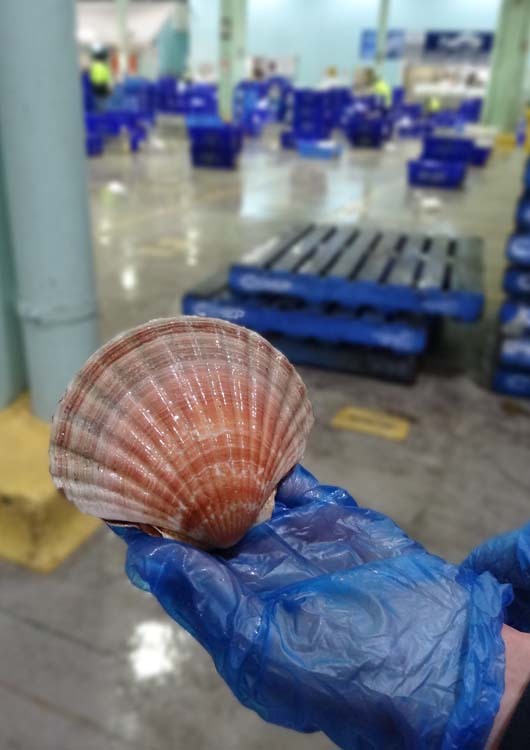 The incredible variety of seafood is sourced from individual fishermen, co-ops, fishing businesses and aquaculture farms in Australia, New Zealand and the Asia-Pacific Region with over 100 species available to buyers daily. 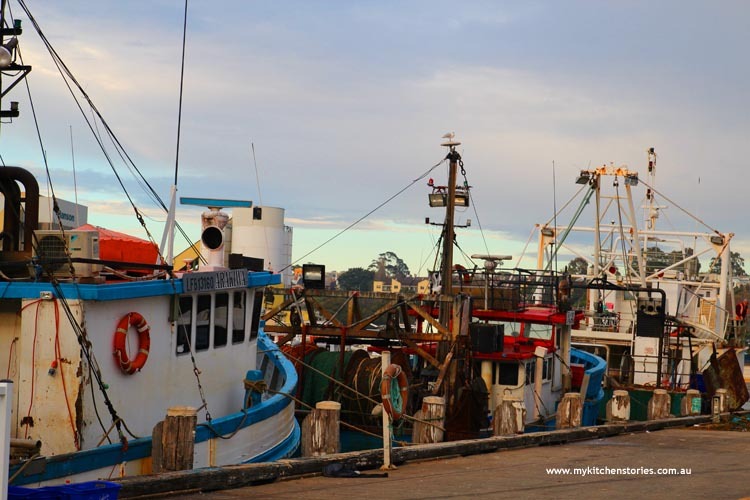 There is a small local fishing fleet in Sydney, once much larger, today the local seafood industry is heavily monitored and the fleet is quite small. 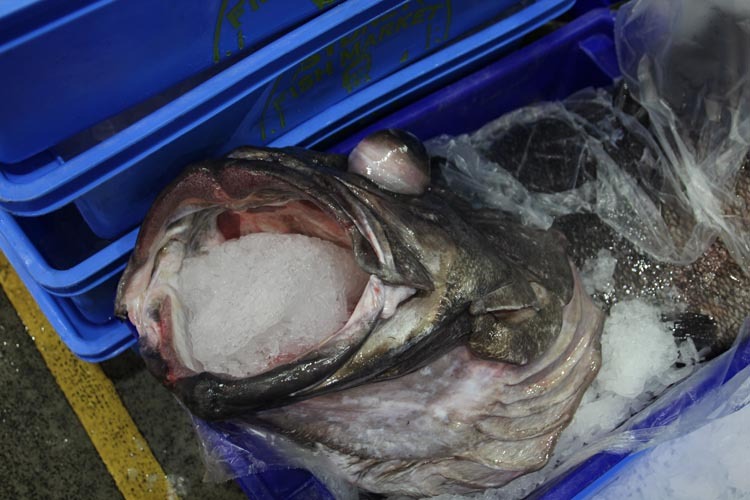 Once sold the fish is loaded into the army of vans and trucks in the carpark to be shipped far and wide all over Sydney and far beyond to shops and restaurants. Buyers can tour the floor before biding. 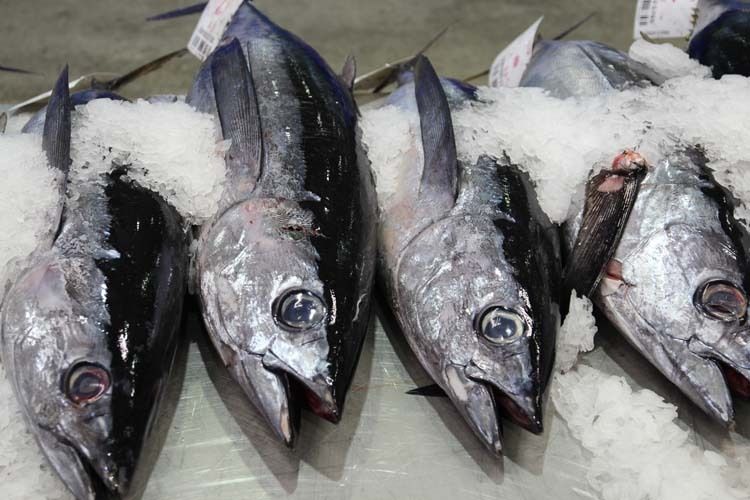 Down here amongst the cold iced fish are benches where Tuna, Bonito and Swordfish are on display. 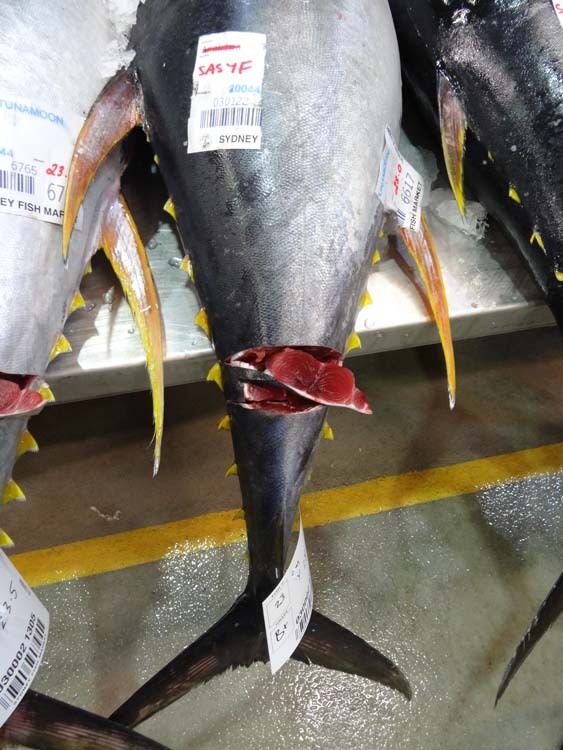 Tuna have a chunk cut from their tails. This small chunk shows the quality of the meat, without having to cut the whole fish. Each Tuna has a score, today there are no fish with a score above B- meaning they aren’t worth the large sums of money that an A would attract. It’s fascinating to see the shiny red quality of the Tuna and compare the scores with the colour and texture of the meat. 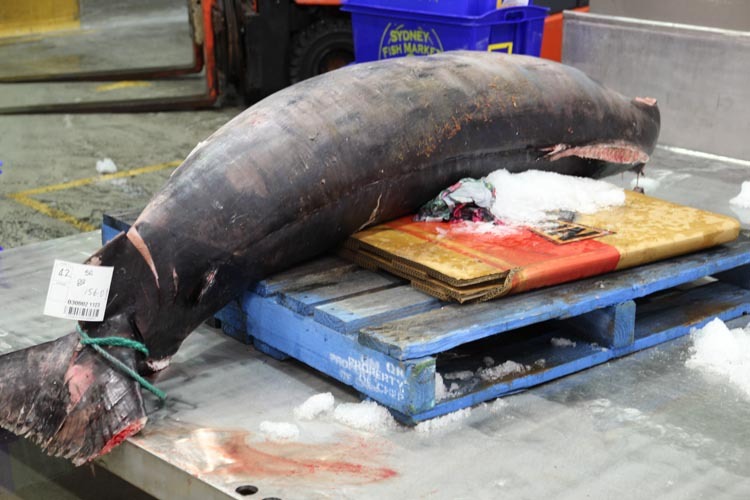 There is a huge Swordfish weighing 156 kg lying fin-less and headless on a bed of ice, there’s boxes of little red fish , striped beauties, magnificently patterned Wobby gong sharks and there’s Lobsters and Crabs being checked for quality and condition off in the far corner. 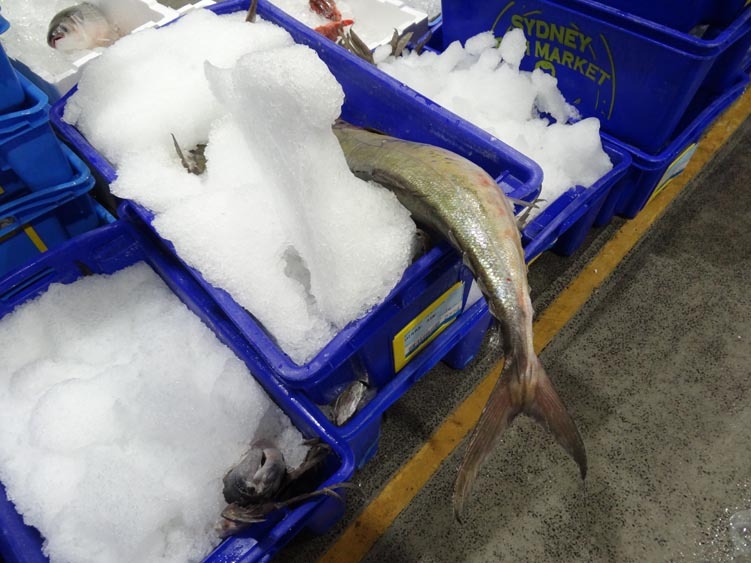 The Sydney Fish Market was established in Pyrmont in 1945 after being moved from the central market area in china town. 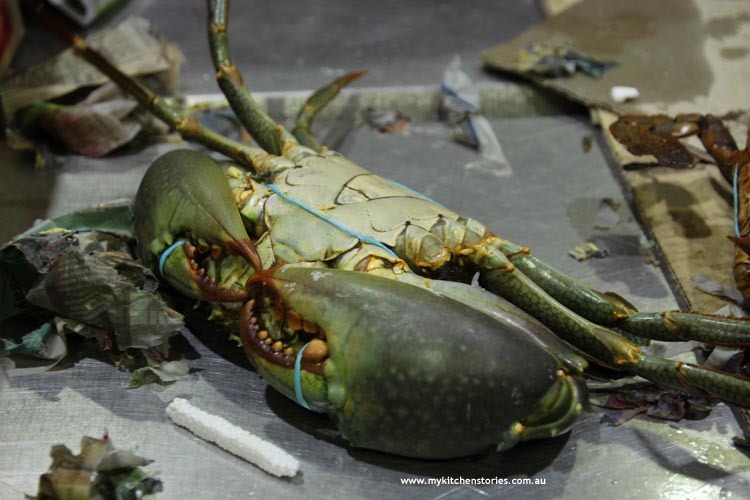 It is the biggest market in the southern hemisphere and has the third biggest variety of seafood species for sale in a marketplace in the world. 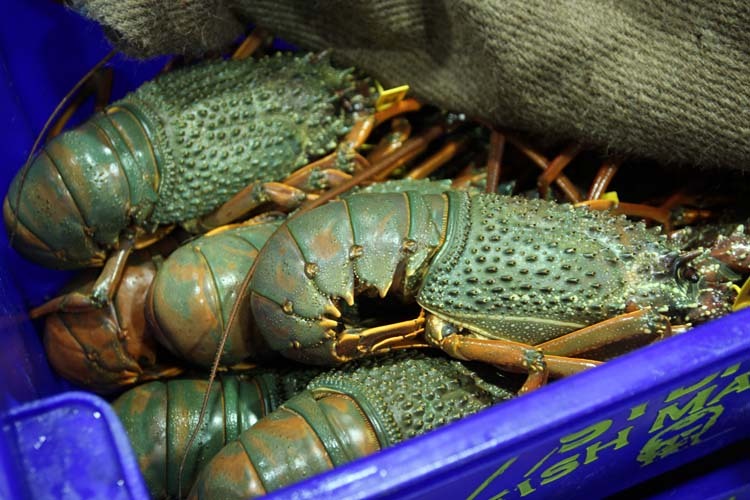 Surprisingly at least 56% of the catch comes from NSW waters and 29% from interstate. The remainder is imported from overseas, mainly New Zealand. 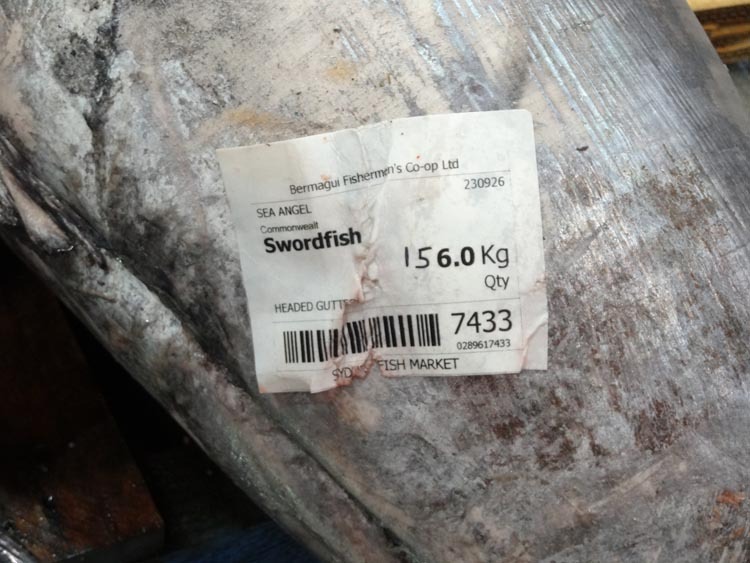 Around 55,000 kg of fish a day is sold. 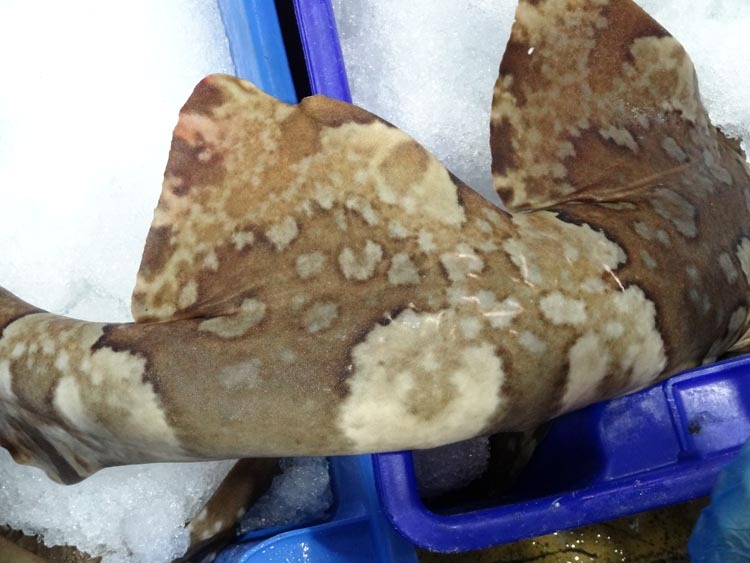 The fish that comes into the fishmarket is heavily regulated with size, species, numbers and condition of the fish scrupulously considered. 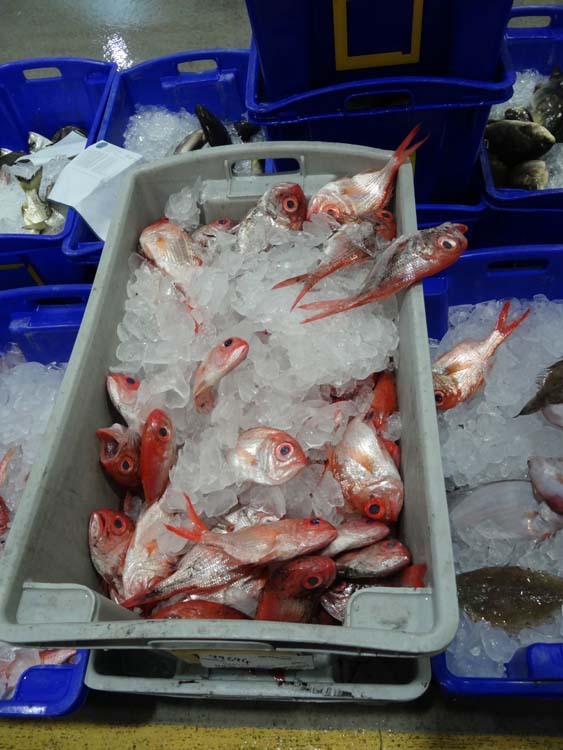 I am very pleased to know that the Sydney Fish Market ensures a sustainable supply of seafood. They do this through supporting responsible fishing practices and encouraging environmentally responsible practices for farmed fish products. This means that fishermen and producers are supported to minimise impact on the environment and unwanted bycatch, as well as training on proper handling, recycling of packaging and waste on site. 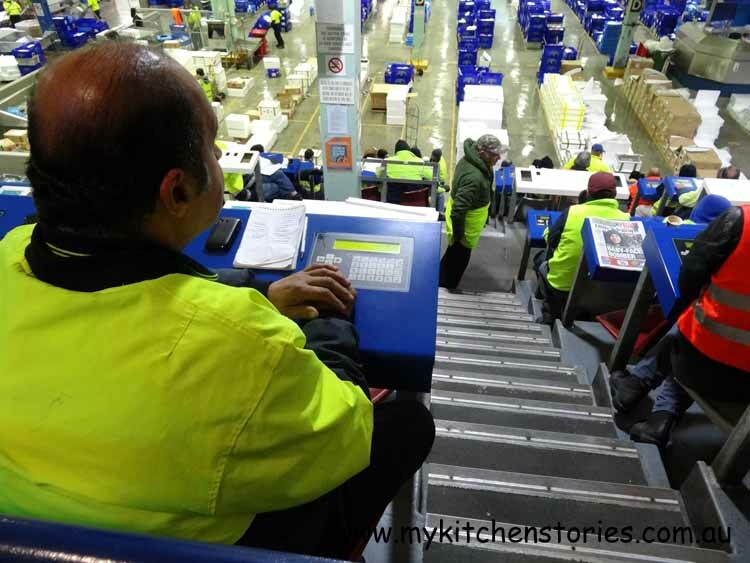 The retailers follow strict health and safety guidelines. It makes me want to come here to buy my seafood knowing I am supporting local fishermen and the Australian industry. 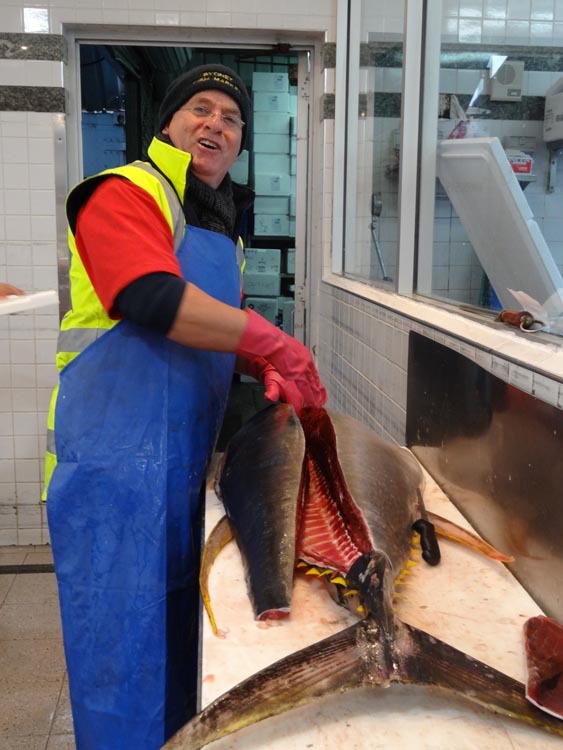 Local shops and most supermarkets do not follow the strict guidelines of the fish market. You can tour the fishmarket too. 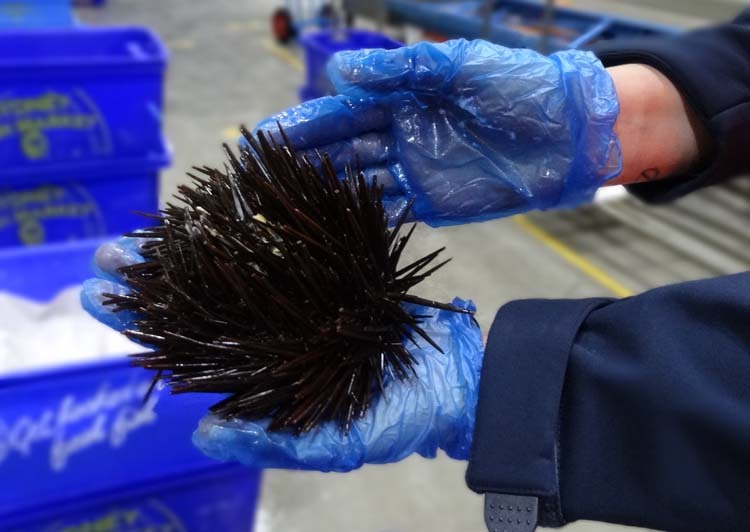 Public tours are conducted by trained Sydney Fish Market guides and take you behind the scenes to explore all facets of the market and its operations – including the auction floor. There are so many interesting things to learn. Did you realize that seafood has a lower carbon footprint than other “land” protein. There s less likelihood of encountering antibiotics, pesticides or fertilizers than other land based meats. Australia has approximately 1/3 of the world’s marine reserves and no species of Australian fish has ever been fished to extinction?. No, me either. Behind the scenes tours are held every Monday, Wednesday, Thursday and Friday (except Public Holidays and between Christmas and New Year). Naturally I couldn’t leave the fishmarket empty handed. 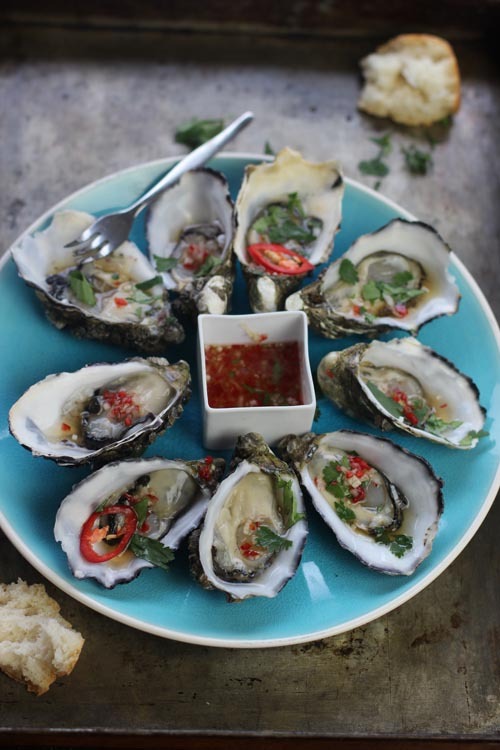 Here’s a simple easy summery dressing for oysters. 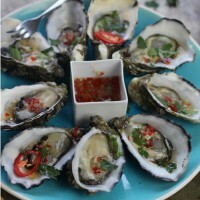 These are giant Coffin Bay Sydney Rock Oysters that make a great starter or canape. If you love seafood and need recipes or cooking tips look here. Great photos! Great market! Incredible selection of such bright and fresh-looking seafood. 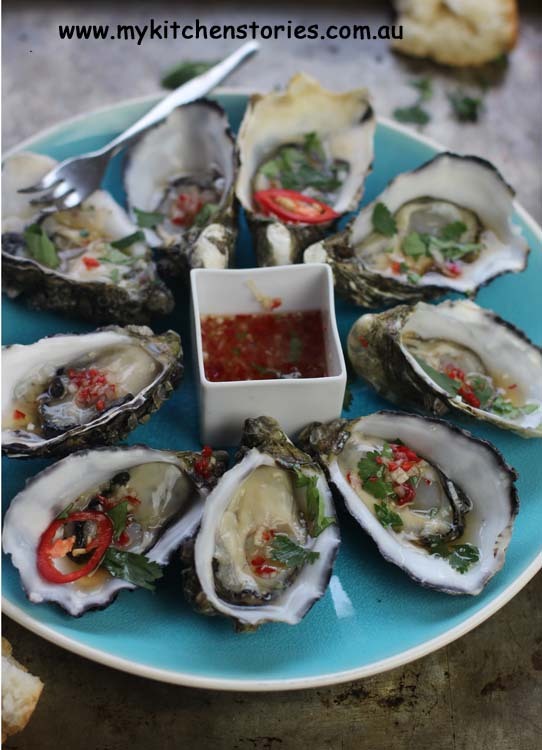 I would never have thought to pair oysters, which I adore, with maple syrup, which I also love. And fish sauce. I can only imagine that it would be interesting and really tasty. Incredible post….I would love to experience one such market. I have not seen such a fresh tuna, and to think it does not even make the A grade. I have heard of places around Boston where they sell fresh catch, and we plan to go there one of these days. The oyesters look delicious, the combination of sweet and spice very inviting. If only I lived in Sydney. Wow, I felt like I was on the tour. I love fish, just love it. Everywhere i wander, in Australia or around the globe, I feel drawn to the fish shops or markets. 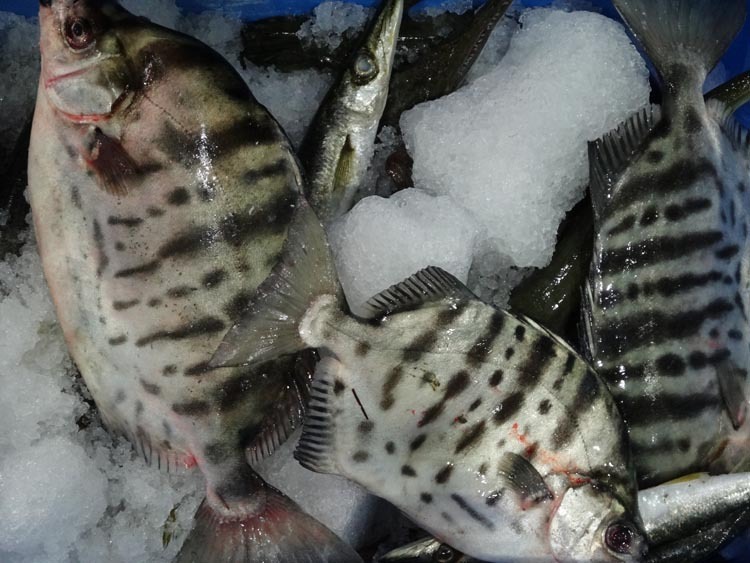 I eat them, photograph them, look at them under the water, catch them…. A great post. Thankyou. Francesca recently posted..Sourdough Diaries. Wholemeal and Spelt. Such an interesting place, Tania… great post! Thank you for an absolutely fascinating story and photo series of one of my favourite places in my old home town! Laughingly I have always put the Sydney Fish Market ahead of the Opera House/Bridge Climb scenario when advising visiting firemen!!! . . . a wondrous place for a foodie to see. Now I have some actual and current info in hand perhaps I should sweet-talk some local friend to have a very early morning call so we could travel the 100 + km necessary and learn for ourselves 🙂 ! What a fascinating tour Tania. I never knew such a thing as a fish auction existed! I didn’t know all that about the Australian industry either although I did know that a lot of the stuff you can buy sadly isn’t sustainable. Great post, Tania and very interesting. I have been thinking about doing a tour (and course) here for some time. Thank you for the inspiration! I remember going here early in the morning and it was such a different world! I can relate to the guy in the last pic-I’m not a morning person at all. This recipe sounds fantastic! the oyster is really finger licking good!!! John could happily eat 5 dozen oysters at a time. He does it the same way every time. He counts the oysters and then when he’s done, he counts them again. It’s weird. Then one day his mother was with us and she did the same thing. I laughed. He’d love your oysters! I’ve heard about the Sydney Fish Market but I’ve never been there. Looks really interesting. I remember doing the fish market tour back in high school. The auctions are always impressive!